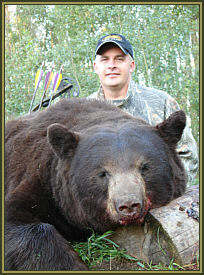 South Peace Outfitters offers guided black bear hunts, moose hunts, elk hunts, mule deer hunts, whitetail deer hunts, wolf hunts, coyote hunts, waterfowl hunting including duck hunts & goose hunts, and fishing in Alberta Canada. 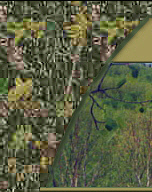 South Peace Outfitters is owned and operated by myself, Don, and my wife, Jackie. I am in camp for every hunt and will be one of your guides. With over 30 years of personal success I enjoy hunting and providing clients an excellent hunting and fishing experience. 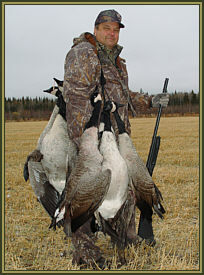 We offer hunting opportunities for black bear, moose, elk, whitetail deer, mule deer and waterfowl in an 1800 square mile area of the Peace River Region of northwestern Alberta, Canada. The region has a perfect balance of boreal forest and agricultural land and has a large population of trophy quality big game. There are three major river systems and numerous lakes, including Lesser Slave Lake, where you will see thousands of migrating and nesting ducks and geese and have an excellent time fishing for walleye, pike, perch, and trout. 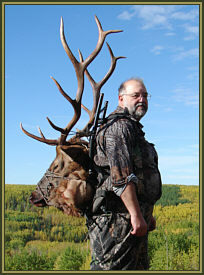 We offer guaranteed tags and quality guided hunting and fishing in Alberta Canada. All of our hunting and fishing trips are successful in that we give 100% effort and make new friends. We maintain an honest interest and offer personalized "hands on" service. 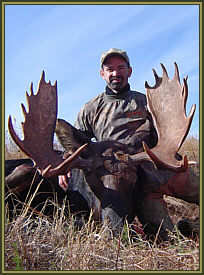 Join us for your next Alberta hunting adventure for black bear, moose, elk, whitetail deer, mule deer, waterfowl and fishing in Alberta, Canada.